Throughout the year, postgraduate students engage in solo and group projects, making use of the School’s dedicated spaces and the variety of external venues on campus and across the city. As an MA Fine Art student, you will work towards a degree show alongside other students which takes place at their end of your course. 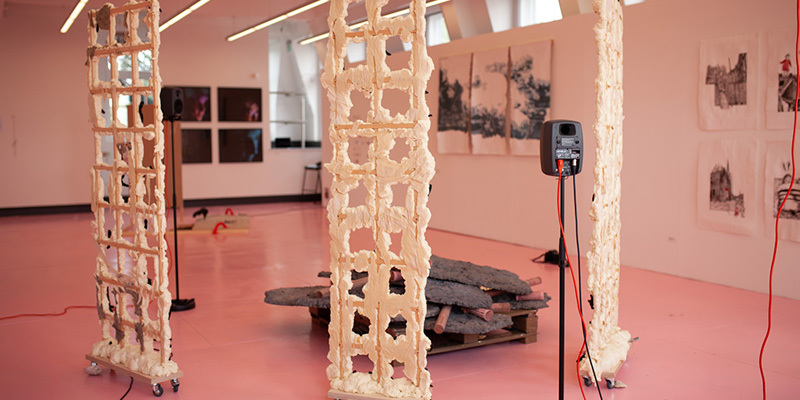 The degree show, usually in the summer, is open for a private view and later formally opened to the public for daily visits. .
MA Fine Art students organise their own exhibitions across the year, on campus and further afield. #GE18 — The General Election of Governing Emotions on 21 June 2018 (organised by MA Fine Art student John Ledger and PhD student John Wright) took place across two venues in Leeds: 130 Vicar Lane and Art Hostel. All students on our MA Art Gallery and Museum Studies, MA Arts Management and Heritage Studies and MA Curating Science courses curate a group exhibition as part of the Interpretations core module. Read about the 2018 group exhibitions. Drawing on action learning approaches, you will work on a collaborative curatorial intervention with one of the archives and collections on campus. This experience prepares you for the option of undertaking a negotiated work placement or optional modules exploring audiences, participation or engagement in semester two.